Drive-in theaters may seem like a thing of the past but there are still enough drive-in movies showing across Ontario to allow you to experience movies outside on a big screen at least once. Drive-in movie theaters are concentrated in two spots; bigger cities and cottage country, likely because they offer operators a chance to make a profit in a relatively short season. A great spot for dating teens and young families on a budget you can usually see two movies for a relatively inexpensive price. Not all theaters are showing up to date movies but that can be part of the charm of this dying breed of theater. My memories of the drive-in go as far back as the sixties when as teens we would sneak in as many friends as possible into the theaters. 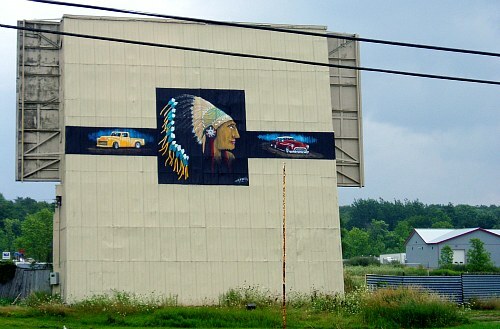 Back then the drive-in was a popular venue for movies and they seemed to be everywhere. Fast forward to the seventies and we were packing our own beer and big bags of pop-corn. That summer we seemed to watch movies for free more than we paid as we kept getting free vouchers because of the rain. When our kids were little we used to take our station wagon and put them to bed in the way back. Our son didn't always fall asleep but we got a night out at the movies. If you are looking for a drive-in movie theater in cottage country that are still operating today check out the following areas. There are of course locations across the GTA and in places like London, but I think there is something more quaint about going to the drive in at the cottage. Return HOME from Drive-in Theaters.